For several decades antimony electrodes have been used to measure the acidity/basicity -- and so to determine the pH value. Unfortunately, they allow for measuring pH changes of solutions only at a certain distance from electrodes or corroding metals. Researchers at the Institute of Physical Chemistry of the Polish Academy of Sciences developed a method for producing antimony microelectrodes that allow for measuring pH changes just over the metal surface, at which chemical reactions take place. Changes in solution acidity/basicity provide important information on the nature of chemical reactions occurring at metal surfaces. These data are particularly important for a better understanding of electrochemical and corrosion processes. Unfortunately, the measurement methods used to date in the research laboratories did not allow for observing the changes with sufficient precision. The information on basicity or acidity is contained in the well-known and commonly used pH value. pH for pure (inert) water is equal to 7, for hydrochloric acid -- 0, and for sodium hydroxide (one of the strongest bases) -- 14. "Until now we have not been able to measure pH changes at places where the most interesting things occur: at the very metal surface. The measurements had to be carried out at a certain distance, in the electrolyte bulk, as we call it. 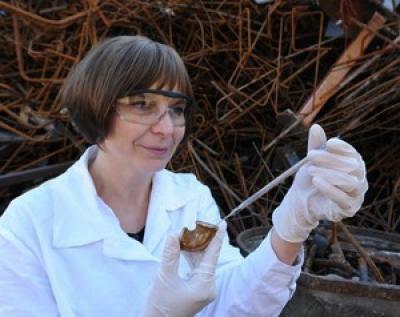 It's obvious that the data collected under such circumstances not always accurately and not always immediately reflected what was really going on at the metal surface," says Dr Iwona Flis-Kabulska from the Institute of Physical Chemistry of the Polish Academy of Sciences (IPC PAS) in Warsaw. In an attempt to better understand the mechanisms governing the electrochemistry and corrosion of metal surfaces, researchers from the IPC PAS developed a new measurement tool. It is an antimony microelectrode with a design allowing for performing easy and reproducible measurements just over the metal surface -- at a distance of one tenth of a millimeter only. A patent application for the device was filed. A good point of the microelectrode developed at the IPC PAS is that the measurements can be easily performed. The designs available earlier on the market required, i.a., the use of micromanipulators for precise placement of electrodes at the surface. "We make use of ordinary geometry. We just move a flat cut glass microelectrode tip closer to the surface of the tested metal, at an appropriate angle. We know the tip diameter and the angle, at which it has been moved closer to the surface, so we know immediately how it is tilted to the surface, and therefore what is the distance between the metal and the antimony core inside the electrode," says Dr Flis-Kabulska.